WHERE DOES MY ZINE GO? Here’s an introductory list of some of my favourite zine fairs. You’ll need to apply to them and shell out a bit of money for a table. My personal advice for beginners (that worked for me, anyway) is – don’t aggressively assault people with flyers or spiels to sell your zine, but also don’t look *too* scared behind your table. Also, buy food and drink for sustenance and snacking beforehand – and make at least SOME of it fruit and water rather than all fizzy Haribos and beer. Sarah likes knitting behind the table. It puts people at ease, especially her AND me. 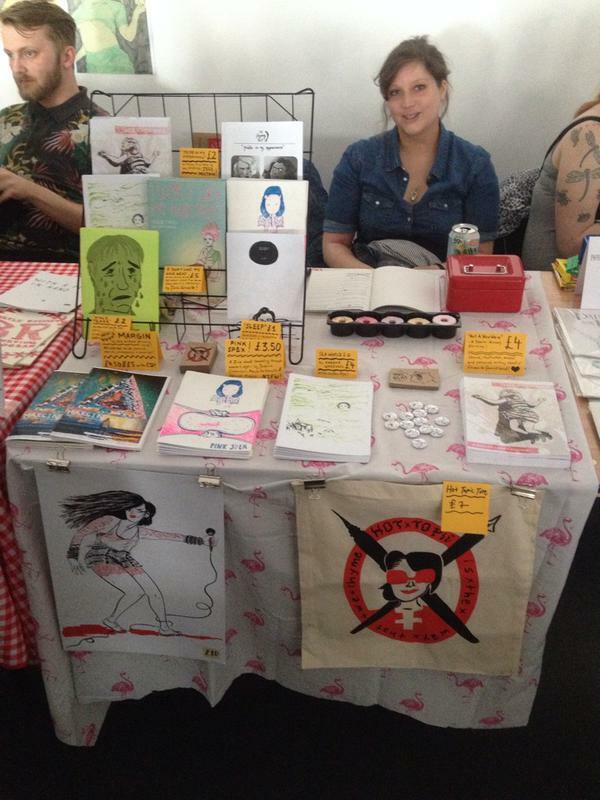 Bristol Comic and Zine Fair: one of my favourites, though I only managed to go twice so far. Good organisation, good stuff, lots of fun. Usually takes place around October, for one day. There’s step-free access and a special Accessible Hour to help people with extra mobility needs get around. Tables and half/tables are usually very affordable. It’s free to attend! DIY Cultures: This one’s in London and it’s amazing. With many workshops and programmes featuring great artists and activists, this is a one-day festival “exploring intersections of art and activism”, and it has a sizeable zine fair going on as part of it. It’s usually around May and takes place at Rich Mix, which is a nice venue and fully accessible. Tables are very affordable. DIY Cultures is produced & curated by a core collective of Sofia Niazi of OOMK, Hamja Ahsan of Shy Radicals/Free Talha campaign/Other Asias, and Helena Wee of Other Asias/POST artists. Safari Festival: organised by the ace team at Breakdown Press, this is a small but excellently curated festival that usually takes place in August. The tagline is “New Waves In Contemporary Comics and Art”, and much like BDP’s output you can expect table fare that pushes the boundaries of what you might expect at your regular comics festival. I recommend browsing before applying to see if your stuff fits the bill to avoid disappointment. Safari is usually at Protein and features great DJs throughout the festival, and an after party with even more great DJs and excellent bands. Table prices are moderate. The Protein website doesn’t seem to have info about accessibility but there is step-free access to the hall the festival takes place in. Thought Bubble Festival: Thought Bubble isn’t a zine fair but an increasingly gargantuan and curated comic con that runs over two days in September in Leeds – but don’t let that put you off, because it is extremely zine and small press-friendly. Big name creators and new kids mingle in three marquees and one hall with very democratic table allocations and a main focus on art. It is also my favourite con and always A Time, even though massive crowds and excessive party times can lead to a rollercoaster of mood swings (remember that thing about eating fruit and drinking water ESPECIALLY for this one). If you have no-one to leave at your table, there’s volunteers that will check whether they can bring you food or drink. Comics artist from around the world attend. Tables are very decent for a comic con but pricey if you’re used to zine fairs – and there’s so much selection on offer that there’s a very good chance you won’t make your costs back if you’re new to the scene. But! A lot of people still value it on the experience/new friends alone. It’s one of our favourites though, so we’re extremely biased (because it’s good, we’re biased because it’s good). Highly recommend if you can afford. Alternative Press: I haven’t been in a few years due to bad timing, but I think I did my first one of these in 2008. That is nine years ago. Imagine that. AP is a staple in the London zine fair world and so many events and things are affiliated with it that I’m just going to tell you to read the website as I can’t possibly list everything here without going on and on. ELCAF: The East London Comics and Arts Festival is organised by NoBrow and very specifically curated – they mostly accept professional/well-printed stuff of a certain style or popularity. Always worth a shot though, eh? Features lovely talks by some of my favourite artists every year, and runs over two days. Usually in June. Tables are pricey. Definitely worth going to as a punter no matter what. Leeds Zine Fair: I’ve never been, but I heard lots of good things from pals! Usually around September for one day. Organised by the Footprint Workers Co-op, it also has lots of workshops (including printmaking ones!). Glasgow Zine Fest: Full disclosure – I haven’t been yet, but I can’t wait to go. Website looks ace. Go see for yourself.